I cook most beans the same way I cook most soups. I like to alternate between red and black. Soaking the beans overnight will greatly reduce cooking time. I don’t usually plan this far in advance so I end up cooking it a bit a longer it takes around 2 – 2 1/2 hours to get it the consistency I like. They will however be quite edible, but firmer in about 1 1/2 hours. 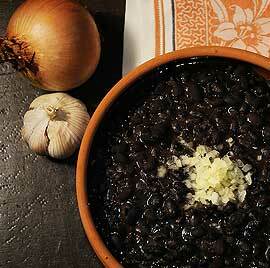 – Wash the Beans and add to the onions and garlic. – Add water and tomato paste. – Bring to a boil, then lower heat and simmer aprox 2 hrs – 2 1/2 hours. And keep checking the water level.